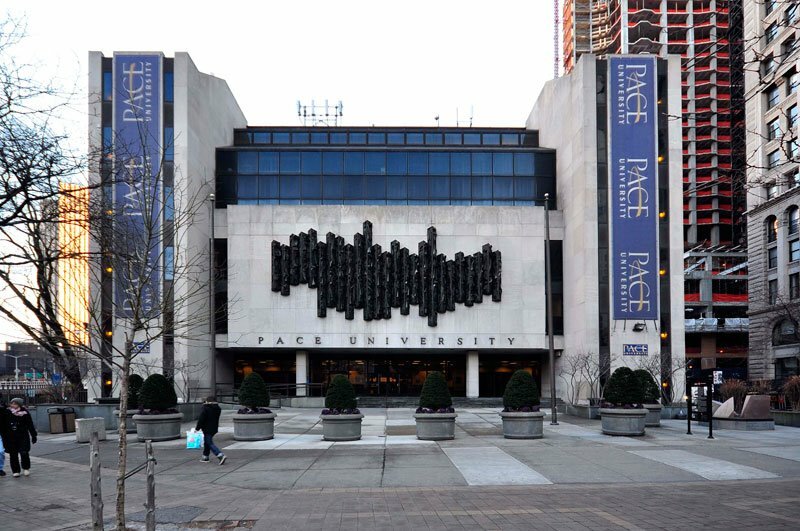 Financial District, NEW YORK—Pace University recently constructed a dormitory at 180 Broadway, roughly eight blocks from The King’s College, reflecting TKC's like goal of owning its own centralized housing building. After two years of construction, the Pace University housing complex welcomed 600 students for the Fall 2013 semester this past Labor Day weekend. The new residence sits above what will presently become a TD Bank and Urban Outfitters. Pace is working on a similarly-sized dorm nearby at 33 Beekman Street that will house another 600 students in 2015. Both buildings are a short distance from the university’s Manhattan campus located at 1 Pace Plaza. TKC’s long-term goal for housing is to own the buildings it occupies. “It’s the next big step the college needs to take, owning the buildings that we’re in,” Housing Director and alumnus Nick Swedick said. The college currently leases apartments from buildings in Midtown, the Financial District and Brooklyn Heights. Swedick said the short-term goals of the college include vacating Midtown and "getting students closer to campus.” King's is approaching this goal with its recent leases at 95 Wall Street and 10 Hanover Square. TKC's brokers are continually searching for potential buildings; Swedick revealed that the school is looking this week at a building in Brooklyn Heights. The search is centered on the Financial District because students could walk to the school in a safe environment and avoid daily transportation costs. “We are being strategic and specific of what we want in a building, and we’re constantly looking for that,” Swedick said. Some students agree that a centralized housing complex would be the next best step for the college, while others still prefer the real-life experiences that accompany living in an apartment building with other New Yorkers. Kayla Redd (‘16), helmsman for the House of Sojourner Truth, moved from campus housing in the Herald Towers to the Clark Street residence in Brooklyn Heights, and claims to have already seen the community benefits that living in an all-King’s apartment building brings. Though the building is almost entirely occupied by female King’s students, Redd said she does not feel secluded from other New Yorkers. “You walk out on the street and you’re not on a campus, but you’re on the streets of New York City with a million people rushing by,” Redd said. Jon Craig, helmsman of the House of Sir Winston Churchill, sees living in buildings with people outside of King’s as beneficial to students who are becoming adults. “I think that being in an apartment building throws you even deeper into what it means to be living as an adult and what it means to be living in the city,” Craig said. “I think that we have done community well living in apartment buildings, but I also think that it would be the next step to not have a dorm, but to still be in an apartment building that was all King’s students,” Lambdin said. Lambdin sees the day-to-day interactions that a building like this could bring as crucial to the development of a strong community.